In the last post, we read about the Ratha-yatra in Nepal. Today we will read about a similar yatra in Egypt. But prior to that, we will briefly read about the Puri Ratha-yatra to better understand the concept. 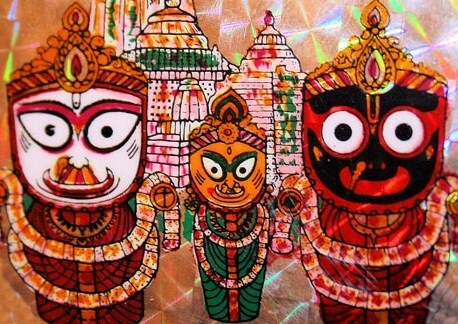 In the Puri Ratha-yatra, idols of Lord Jagannath (Krishna as the lord of the universe), his brother Balarama and their sister, Subhadra are taken out in three huge and magnificent chariots pulled by thousands across the town of Puri. The yatra begins from the Jagannatha Temple and is taken to about 2kms away to the Gundicha Temple. 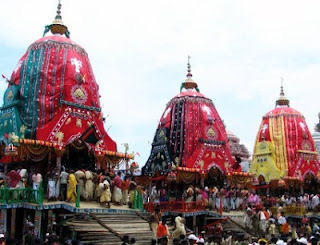 The Lords rest at the Gundicha Temple for a week and then the same procession comes back to the Jagannath Temple in what is known as the Ulta-ratha-yatra, i.e. the reverse procession. There is celebration over these seven days and the procession marks joyous cheering all along the route. Reference of the Ratha-yatra can be found in the Vedic texts thousands of years ago, though the present Jagannath Temple came into existence much later. The story of Lord Jagannath is mentioned in the Puranas too, carrying on the tradition of the yatra right from the Vedic times. In the earlier days, the King of Puri had a very important role to play and even today the descendants of the royal family are called in for the ritual sweeping of the chariot before the yatra begins. Without delving too much on this, let me focus on a similar yatra in another continent altogether. Ancient Egypt used to host a famous festival called the Opet Festival. 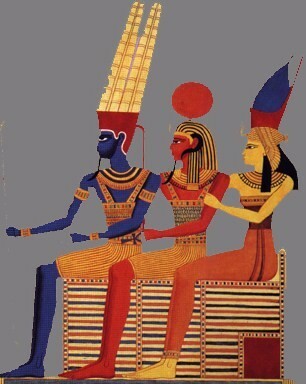 The Opet Festival was celebrated in the Thebes during the second month of Akhet, i.e. the season of the Inundation which in today’s times would be in the month of August/September. At this time the Nile would overflow and all the crops would be under the much needed water and there would not be much work for the then Egyptians. Initially the festival lasted for a week and later it became a two-week festival. 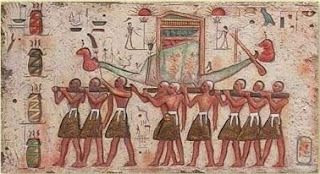 The most important aspect of the festival was the towing away of the Theban triad of Amun, Mut and Khonsu southward on their barques both by boats and by men along the shoreline amid much fanfare and celebrations. The procession would start from Karnak and end about 2 miles away in Luxor and would stop midway for the priests to rest as well offer prayers till they reached the final destination. The Pharaoh would preside over the rituals prior to the procession and would return along with the deities. For the ancient Egyptians this was both a fertility ritual as well as a renewal of the Pharaoh’s right to rule. The timing of the festival during the Inundation signifies its association with the fertility rituals. Similar rituals were performed with the Pharaoh which established his ties with the deity Amun. The Egyptians had a belief that over the course of the year, both the deities and his representative on earth, i.e. the Pharaoh, would grow tired thus diminishing their powers. The rituals performed during the festival would ensure that the power of the universe would return to the deity and his representative! In both the processions, there is a triad. 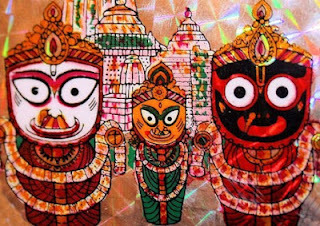 In the Opet, it was the triad of Amun, Mut and Khonsu while in the Puri yatra it is the triad of Jagannath (or Krishna), Subhadra and Balarama. The Opet festival lives on in the present day Egypt in a different form, when a procession of a Muslim saint is carried out in a model boat. The idea is not to establish the ‘supremacy’ of concepts, but just to highlight the fact that the world then was more open to cross-cultural concepts, be it philosophical or mythological and religious. People were not so rigid then and cultural assimilation was a norm. Modern times have undergone a sea change where rigidity and deep rooted faith and belief system has taken precedence in our day to day life. I go back to the introduction of the series where I said that the world was one; man broke it into pieces! Recently I came across some interesting events which makes me wonder if the world was one and man broke it up into different countries. Similarities in festivals across borders have always been fascinating and here I will write about one such festival which has strong resemblance to one of our festivals, i.e. the Rath-yatra of Lord Jagannath, Puri, in Odisha. Nepal is known for its picturesque beauty and is a Hindu nation, so it is not uncommon to find Hindu gods and goddesses and temples in that country. The famous Pashupatinath Temple and a few Shakti-peeths are well known pilgrimages which have their own myths. Nepal is also a Buddhist centre of pilgrimage and there are numerous centres for the Buddhist belief. However, what has drawn my attention is a recent chariot-festival in the country which is known as Rato Machhindranath Yatra which is an important festival for both Hindus as well as Buddhists of Nepal. Rato Machhindranath, “Rato” means red and “Machhindra” means fish which is derived from “machhindra” or “matsendra” and finally “nath” meaning god. Rato Machhindranath is a red coloured deity and is a god of rain in Nepal and is worshipped just before the monsoon starts. Nepal is an agricultural country and farming being the mainstay of close to 80% of the local population, lends credence to the significance of rain. 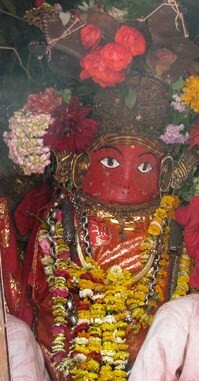 The deity is worshipped to ensure a good monsoon and prevent a drought. An interesting myth is associated with the deity. According to a legend, Gorakhnath, a renowned disciple of the deity visited the valley, and was upset at the lack of importance given to him. He then caused a drought by taking away all the rain-making snakes with him. The troubled Nepalese then prayed and begged of the deity to save them. The deity was in Assam, India, at that time, and on hearing the pleas, came to Nepal in the form of a bee. On learning that his deity was in Nepal, Gorakhnath had to release all the snakes to pay his tribute thus causing rain and also learning a lesson of humility in the process. The high point of the festival is the building of a huge three-storied chariot where a replica of the deity is housed and pulled by hundreds of believers. The chariot is taken all over the city of Patan in Nepal and the journey lasts for a few weeks which are earmarked for celebration. The journey is accompanied with beats of the traditional drums and cymbals. This aspect of the festival is common to the famous Ratha-yatra of Puri, Odisha. In the earlier days, the King of Nepal used to flag off the yatra, again a similarity to the Puri-yatra, where even today the descendants of the erstwhile royal family sweep the ratha, i.e. the chariot before the beginning of the journey. One of the important rituals of the Rato Machhindranath Yatra is the pouring of water on the deity. Four priests with silver jars stand in four directions with the deity in the centre. At the signal of the chief priest all four priests lift their jars and pour water on the deity. The priest who manages to pour water first, would enable good monsoon and better crops in the said direction! 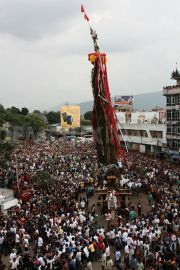 Rato Machhindranath is worshipped by both the Hindus and Buddhists. 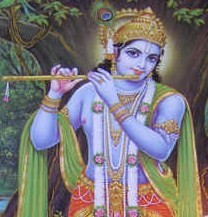 The Buddhists consider him to be their Avalokiteshwara or Lokeshwara, the Bodhissatva of compassion or Bunga Deo, i.e. the god of agricultural prosperity. 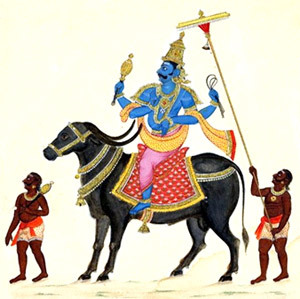 The Hindus consider him to be a form of Lord Vishnu (reference of Matsya avatar of Lord Vishnu). A popular version considers him to be a god who was brought in from Assam by a local farmer to ensure good monsoon in Nepal. The Nepalese are also worshippers of the Naga’s, i.e. the snake-gods. The reference of rain-making snakes in the earlier myth shows how well every section of religious beliefs has been weaved into this festival. The locals believe that during the festival and the rituals, the Nagas, rain-making snakes observe the entire proceedings from the clouds. Next we will read about another Ratha-yatra which used to take place continents away from ours. Samuel Taylor Coleridge, the English poet is supposed to have said – “No mind is thoroughly well organised that is deficient in a sense of humour”. Couldn’t agree with him more, especially since the unorganised minds in a particular address of our country, known as the Parliament of India, seem to be taking us towards a humourless society. A simple expression of thought in a humorous drawing (call it ‘cartoon’ if you wish) has set all our politicians up-in-arms. Is cartooning such a denigrating profession? Or is it a form of art which has become a trifle dangerous for the ubiquitous humourless political ilk? 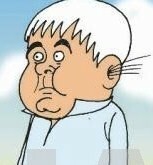 What with the likes of R K Laxman, Shankar, Sudhir Dar, Mario Miranda who have achieved iconic status as cartoonists? None faced the wrath of any politician the way the present ones are facing. Does it have to do with the fast evaporating sense of humour of this class of citizenry who are the real the source of such humour? US President, Thomas Jefferson is supposed to have said – “Good humour is one of the preservatives of our peace and tranquility” – something quite contradictory seems to have happened here in our country. A certain lady from the East, put a man behind bars for circulating a cartoon (Freedom of expression is no more a right I am told, so I will refrain from taking her name, lest I be whisked away from my residence and thrown into the recently painted blue dungeons by her goons). No amount of hue and cry got him a bail till her whims decided to bestow benevolence on the poor man! She prefers participants in drunken and street-side brawls as against innocent humorous caricatures! What a sorry state (quite literally too!). Here in West, the office of an educationist who assisted in the compilation of certain text books was ransacked by few obscure goons, owing allegiance to a political party set under the shadows of a national Hero (I am scared to take the name of anybody, for though Kipling might have said “Oh, East is East and West is West and never the twain shall meet”, the times have changed and the twain seem to be shaking hands in every silly aspect of common man’s life!). Dear Mr. Jefferson, your quote is outdated in my country and good innocent humour has only led to the lack of peace and tranquility! Recently on TV, I heard a certain ex-Railway minster who is a rich source of humour for people of all ages and class and was associated with sudden depletion of fodder in his state (I insist on not taking names just to continue to live a happy citizen in this humourless country!) ridiculing the cartoonists. Needless to say, that half of what he said was lost in the uproarious laughter that followed no sooner he started mumbling. I couldn’t hear what he mumbled, but to be fair to him, I think all cartoonists should refrain from drawing his caricatures. His ‘honest’ photograph does what a good cartoonist cannot! In the olden times, there were deities of humour, who were both venerated and worshiped. The Greeks had Baubo, a goddess of humour who was bawdy in her behaviour, but managed to lift spirits wherever she went and provided spells of laughter in otherwise serious epics of the Greeks. 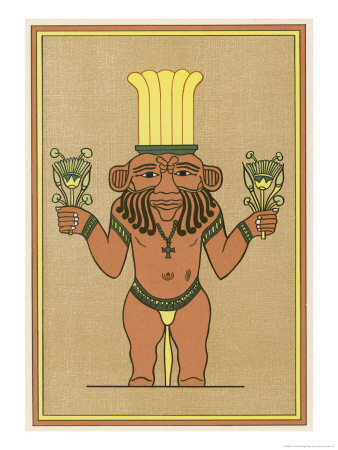 The Egyptians worshiped Bes, who was considered to be a god of humour. Bes was unique in the sense, that he was the only deity who was always depicted as full-face unlike the profiles that all other deities were depicted as in Egyptian mythology. Bes was also considered to be the god of child-birth and was supposed to be dancing and yelling in the room where a child-birth was taking place to ward away the demons who were hungry for new life. The Egyptians believed that when a new-born child smiled all by itself, then it was because Bes was making funny faces at them! Even our gods, like Lord Krishna and others like Narada Muni, were known to indulge in pranks and generate the much needed laughter and all at the expense of the others. So why are our political brethren getting so uppish and devoid of the much needed sense of humour? Mahatma Gandhi is supposed to have said – “If I had no sense of humour, I would long ago have committed suicide”. All the self-proclaimed politicians who sing paeans to Gandhiji at the drop of a hat should take his quote seriously. Can you imagine the good fortune of a sudden elimination of the entire humour-less community! In the Greek mythology, Hades is the god of the Underworld, which is where all the dead are taken. Hades is greedy, as he wants to increase the population of his world and that is what causes deaths. The Underworld has an interesting geography. Underworld is a place which is hidden in the earth and is surrounded with many rivers. They are the River of Woes, the River of Lament, the River of Fire, the River of Forgetfulness and the River of Oath. The Adamantine Gate forms the entrance to the Underworld, which is guarded by Cereberus, the three-headed dragon-tailed dog, who allows entry, but never an exit from the Underworld. The dead are ferried by an aged boatman named Charon who takes the souls across the River of Woe. The dead are buried with a coin in their lips; this is to pay for the fare for the ferry ride. Those without the coin are eternally trapped between the two worlds. The souls which manage to enter the Underworld, have to appear before three judges, Rhadamanthus, Minos and Aeacus, who pass a judgement based on ones deeds on earth. The wicked and the evil are sent for an everlasting torment, while the good are sent to the Elysian Fields, a place of blessedness. The Underworld is not a very pleasant place; rather it is painted as a miserable place where no sunlight or hope can enter. It is a vague, shadowy place where there is nothing. It seems like the highly descriptive Greek poets have not indulged in the dull gloomy aspect of death beyond this! As we see, the Greeks too believe in life after death like the Hindus, but there is no mention of the cycle of birth, death and birth. 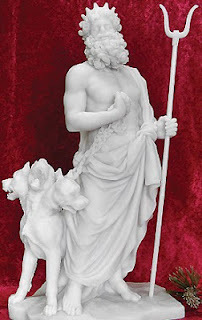 There are many stories associated with Hades, the most famous being the kidnapping of Persephone (http://utkarshspeak.blogspot.in/2011/03/demeter-persephone.html ). The Egyptians had a very firm belief in life after death. 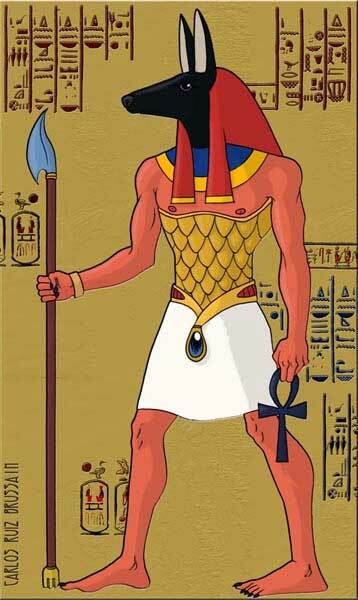 According to the Egyptian mythology, Anubis and Osiris were the gods of the Underworld. After a person died, his soul was taken to the hall of the judgement in Duat by Anubis, who was the god of mummification. Here goddess Maat acts as the judge of morality. She would weigh the soul of the dead against her ostrich feather in a scale, and if the soul balances against the feather, then the soul reaches paradise. 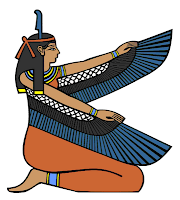 If it weighed heavier than the feather, a sign that it was a soul which harboured evil deeds, then it would be given to the crocodile headed goddess Ammut (some say she was lioness-headed), who would devour it and would be relegated to the underworld. This way the Egyptians believed that there would be balance, and just as the good would get rewarded, the evil would get punished. According to the ancient Egytians, the soul was made up of three parts – Ka, Ba and Ahk and it was important to ensure the safeguard of all the three parts. The elaborate burial rituals were for the preservation of the body and the soul. The ancient Egyptians followed an elaborate process of mummification, as they strongly believed in the afterlife of the body and soul. The embalming and the preservation of the body were to preserve the individual’s identity during his afterlife. As a part of the embalming process, most of the body organs were removed before the burial, except the heart as the Egyptians believed that the heart was the home of the soul. The concept of afterlife was so important that many Egyptians prepared for the afterlife during their lifetime itself. Like the Greeks and Hindus, the Egyptians too believed in trial after death, but unlike the Hindus, there is no cycle of death and life and the concept of salvation. Death is an end of the journey of the soul of an individual. Death, be it in philosophy or mythology is definitely gloomy and sad. The last few articles on death have not been very uplifting, but have definitely been a cathartic for me. Writing about it has probably enabled me to somehow reduce the sense of loss that the recent death has left behind. I can appreciate Oscar Wilde much better now when he says – “One can survive everything nowadays, except death.” So true and so practical, I guess. A recent death of a loved one brought me very close to the sense of loss and void that death leaves behind. A reality which we all know about, but keep avoiding the very thought of it, when it comes to self and near ones. Death makes us turn philosophic when it happens to others, but leaves us numb when it happens to our near and dear ones. Partaking in the rituals after the death, and listening to the explanations being given for the rituals, got me to explore further. Just how does mythology see death? A matter so sad and disturbing has to have some mythological allusions. Mythology talks of creation and destruction and everything in between, so where does death feature in between? Eschatology is a part of theology (and mythology) concerned with the final events in the history of the world or the ultimate destiny of human kind, commonly phrased as the end of the world. Though the subject is more macro in nature, i.e. the end of the world, a subset of the subject also deals with end of man, i.e. death of an individual. For the limited objective of my article, I will focus on death and its meaning in mythology. According to Hindu mythology, Yama is the god of death. With the help of Chitragupta, his accountant, he keeps the accounts of every individual’s deeds on earth and after death decides on the person’s next destination, i.e. heaven or hell. Heaven is for people who have been good and hell is for people who have lived a life of evil. This is something many of us know from our childhood and have also helped us form imageries of what an afterlife is all about. Street side calendars have shown torturous images of hell just to ward off the evil course of life to mere mortals. Let’s take this slightly beyond this childhood imagery. Yama is considered to be the son of the Sun god, Surya and the twin brother of Yami or Yamuna. He is also considered to be the brother of Shani and both together act as judges for mankind – Shani, when one is alive by a set of punishments and rewards (reward by staying away from man!) and Yama judging ones actions in ones afterlife. According to the Garuda Purana, when a man has lived his life as destined, the Yamadoot’s, i.e. the messengers of Yama come to take life away from man. Life is taken away in the form of the soul to Yama where the next course of his destination is decided upon. However, the soul is soon sent back to earth and it hovers around the place where the man had died for twelve days. While the mortal remains are assigned to fire, the soul remains restless for the next twelve days as it does not have a body to go back to. It is at this point that the soul gets to evaluate his life and the darker his acts, the worse is his restlessness. On the 11th or the 12th day after performing the ceremonies where food and water is offered to the departed, the soul satiates its hunger and thirst and once again the Yamdoot’s come to take the soul to Yamaloka, the land of the dead. Souls which have lived a life of evil (some acts are mentioned in the Purana) have a tough time entering the Yamaloka and undergo many hardships. One keeps attaining new lives after death and the next life depends on ones nature of deeds in the previous life. This cycle of life after death goes on till man attains salvation by living a life of Dharma, righteousness. It is understood that over so many lives, one would learn to lead a good life, if not by the acts of others then by having read the scriptures. The above is a very simplistic view of life after death. Yama also finds mention in the Vedic times and the Rig Veda mentions Yama more than 50 times. 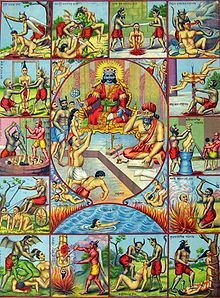 According to some hymns in the Vedas, Yama was the first mortal to have died and was thus by the virtue of being the first was made the King of Death, while some mention him to be the god of Death. Through some hymns, Yama not only communicates with the dead but also consoles the mourners. Some norms have also been laid down by him, whereby, old would die prior to the young, (if there are exceptions, then they are due to the karma of the young one!). Some verses also mention that there would be no more deaths in a family during the period of mourning. Interestingly, the Vedas urge a widow to reconcile and move on with life after the death of her husband. (This goes on to prove that Sati was not a Vedic practice and did not have religious sanction at least during in the Vedic times). It urges all humans to make efforts to lead a full life and not end it under any condition. The Vedas go on to make death a natural necessity of earth to avoid the dangers of mortal population on earth! This Vedic simplicity and the obviousness of such a tragedy make one look at the whole thing much more philosophically. I now understand John Dryden’s quote much better when he said – “The world’s an inn, and death is the journey’s end”. Next we will see how Greek and Egyptian mythologies treat Death. Once upon a time, there was a lovely forest, green all around, crowned with lovely blossoms and birds chirping on every tree. On one of the trees was a nest where lived two larks. The father lark would go gathering worms every day, and the mother lark, flush with pride on the eggs laid by her, would spend the whole day nurturing her eggs. Soon it was time for the eggs to hatch and the proud mother lark saw the face of a small lark making all efforts to nudge itself out of the first egg. The mother lark shed a tear of joy and pride on seeing it’s first born and announced it to the world with a melody. The whole forest stood still and listened to the song of the lark – a song never heard before, a song of love, a song of motherhood. Soon the other eggs started hatching and the pride only grew. The father lark worked harder to get the worms and the mother lark got busy in feeding and taking care of all of them. The first born however remained her favourite after all she experienced motherhood first through the little one. Soon it was time to teach them to fly and all learnt it well and fast. In due course the younger ones flew away and built their own nests and her once crowded nest wore a deserted look. The larks were left all alone. Soon the mother lark couldn’t fly well and was restricted to her nest, but she did not lose her sprightly will and kept singling her lovely songs so that none in the forest came to know of her loneliness and look down on her young ones, after all this was the destiny of all birds. It was only the father bird who could hear and feel the soulful melodies masked in the lovely songs. There was only one thing that she longed for – she wanted to hear her first born sing for her, as she had heard that he had acquired great skills in singing and was the heartthrob of many in another forest. She knew her time was close, and before she shut her eyes forever, she wanted to see and hear her first born. But the first born had flown very far and could no more hear the soulful songs of the mother lark. 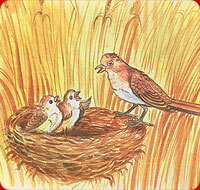 The mother lark soon lost her voice and one fine morning, breathed her last. The forest lost a great soul and everybody mourned the death of the great singing lark. But nobody heard her last words before she breathed her last, not even the father bird, as he was too old to hear, what she could not utter! Yesterday was Mothers Day and this story is an ode to my Mother, who I lost last week.